is savior hot? i need a new zerg hero. naw, keep YellOw. he'll be back. Sometime. >>;; along with mantoss and the rest of them. The 'WTF!' Moment of the Year Award should have gone to boxer's leaving i mean come he IS the Emperor, isntead of mr power rank 5 "Red Sniper"
Sorry, I must be missing something, but what does Hwasin have to do with anything? just trying to make boxer seem higher as "emperor"
T.T I still don't have that nal_ra>savior game! Also, you can get the Boxer vs Jju game on the tracker, thanks to thedeadhaji. Well done Orome. Much appreciated. My only problem is with the Mumyung award. Shouldn't the progamers that couldn't even make it into a starleague automatically be worse than ones that made it in and then got raped? Very nice. Here's to another year of great gaming! Well, mumyung was famous for making it to starleagues and doing absolutely nothing. So, Child fits the spirit of the award perfectly. Now, KTF have three great protoss - Garimto, Nal_ra, Reach. wow. EDIT : And I forgot onething - Saying "Great work Orome! I like all choices"
man look at garimto. Nice'n clean haircut & the cool ktf uniform. Teach them kids how its done properly garimto! MSL is not considered a "Starleague". That's why they say "MSL" and "Starleague", not "MSL" and "OSL". Some of you may of heard of the phrase: "The one and only Starleaguer." MSL and OSL are in a totally different class. OSL is the grandslam of Starcraft. MSL just turned out to be a spoof of the OSL. MSL is NOT considered a Starleague (it just has that name attached to it for publicity). Starleague is distinct. It has it's own program colors: red/white/black. And Proleague is the offspring of Starleague. MSL has no "proleague", MSL is not considered a "starleague". 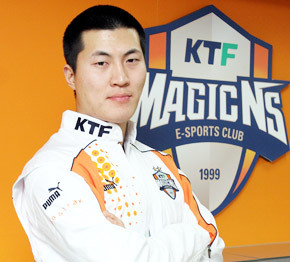 Outside of Korea, MSL is considered a Starleague. MSL was made in Korea. It's like, foreigners telling Germany that the Volkswagan is better than their Rolls Royce and insisting that they should be put in the same class. A man owning 1 Rolls Royce is not as good as a man owning 2 Volkswagen, they would say. But, the Germans are the ones who manufactured the cars, and they have established that Rolls Royce is the better car. The Koreans have established that Starleague is Starleague, and MSL is not Starleague, just a minor league. It's the same for everything else out there. You're not a great soccer team by winning all the little tournaments. You truly get recognized if you can win the World Cup. You are not a truly great pingpong player by winning all the minor national tournaments. You become great by winning the Olympic medals. Sure, your skill level can be the same (or greater) than the Olympic medal winners at certain points in time, but the fact that you have not won the Olympic medal puts you at a lower place in recognition. For all intensive purposes, how about we just call Starleague, OSL and MSL, MSL? It's a difference in terminology and the meaning of 'Starleague'. Apparently, to you and possibly in Korea as a whole (although Live2Win called MSL a Starleague, and he's Korean), Starleague means, 'the big one', the most important tournament. To me, and I think to most people here, Starleague is just a name for a league, nothing more. Therefore, MSL is obviously a Starleague because it has Starleague in its name. It does not make sense for me to change this, same as people all around the world say swiss cheese to something that is definitely not swiss cheese to me. It's a difference in terminology, and there is no correct version.